Many musicians see music purely as art. Some will even see structure and planning as the enemy of the artist. 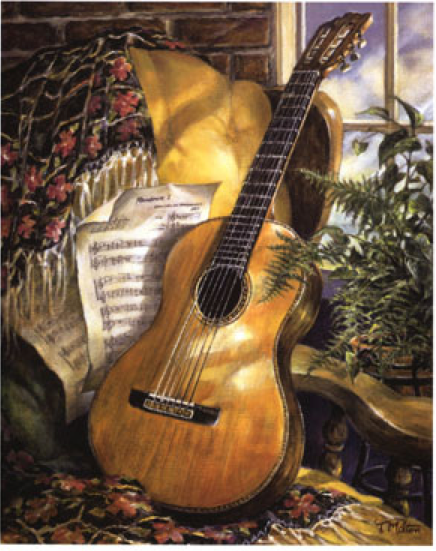 Art is in fact the expression of one's imagination and really has nothing to do with 'learning' guitar other than the teacher finding creative new ways to teach when required. Learning guitar is about acquiring the skills needed to express your imagination musically. When you learn guitar what you seek are the skills and you want to know scientifically if possible the best way to acquire those skills. The artist in you needs to be patient and wait for her/his turn. Now is the time to learn. When you learn guitar you are not playing guitar. There is a big difference. I often make the comparison to building a house. When you begin building your house you won't be living in it for some time. Building a house and learning guitar both require motivation. When doing either your focus should not be heavily weighted on living in your house (playing guitar) but on staying motivated and enjoying the building process. When we focus too much on the goal we start to cut corners and the result is often a house built on shaky foundations. When you focus more on the work/practice you will begin to enjoy the process. This by the way doesn't mean you ignore your goals. Having goals are very important as they give you a clear direction. Is the great artist a great teacher? A great artist is highly respected. In fact when we think of the musicians who influenced us to learn guitar chances are they are just that. Great artists. How can we be like them? Jimi Hendrix influenced many of today's guitarists both directly and indirectly but would he have made a good guitar teacher? I can't personally say but what I do know is I have never read or heard any evidence showing that Jimi was a great teacher. Jimi was a great artist and while it is possible that he may have been a great teacher being a great artist does not qualify him to be a teacher. But please don't misunderstand my message here. I encourage you to seek out a teacher who has the skills and even artistry of a master but make sure they also possess the skill of teaching. A great guitar teacher knows that structured learning is the key. With structure your teacher can measure your progress and ensure you are on track. This does not mean the teacher is inflexible or is unwilling to consider your musical influences but a good guitar teacher will not lose sight of the goal and that is to help you develop the skills of good guitar playing. As you develop the skills you will be able to play the songs you personally prefer but if you can find a teacher who shares your musical preferences even better. If you like this blog please join us on Facebook. Why do children really want to stop lessons? Are piano students just better students?